Around 71% of businesses in the UK & Ireland don’t have a formalised energy strategy in place. That’s according to a new study by Centrica Business Solutions, which also found far less firms have specific targets or budgets in place to support their ambitions. For example, despite more than half (52%) of the 203 respondents citing having back-up in the event of a power outage as very important, only 18% said they have specific targets in place to address this. In addition, only 16% of businesses have set goals to support the link between sustainable energy use and brand image despite being identified by almost half as very important. 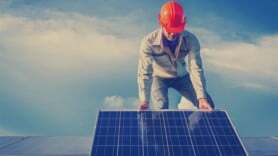 However, the study of more than 1,000 firms from the US, Canada, Germany, Italy, the UK and Ireland, also revealed around 80% of businesses believe a quarter of energy needs will be generated onsite by 2025. Around 77% of UK and Ireland businesses predict this change will take place during that period. It adds around a quarter (26%) of the total firms have already invested in onsite generation in the form of solar and/or combined heat and power (CHP), with a third considering investing in these technologies. Alan Barlow, Director of UK & Ireland said: “It’s a great sign that businesses in the UK and Ireland are really forward thinking when it comes to their energy. Taking control of their energy use is clearly important to them and companies think they’ll be on the road to achieve this in a short space of time.